ECE faculty, staff and students celebrated the recipients of the Anil Jain Memorial Prize on Friday, Jan 11, 2019. The prize was established by Mohini Jain Family Foundation in 1990 in honor of the late Professor Anil Jain and is awarded annually to the best Ph.D. student dissertation in the ECE department. The winner receives prize money and a certificate. Pallavi Daggumati and Juane Li shared the best thesis dissertation award for 2017 and Dong Ji for the year 2018. Prof. Emeritus Ralph Algazi, who was the chair of the department when Dr. Anil Jain got recruited to UC Davis, shared his memory. “Anil promoted excellence at every turn in his life and helped many scientific activities all over the world,” said Prof. Algazi. “Those of us who were closely associated with him will carry his impact in our hearts and feel his loss.” Prof. Bernard Levy talked about his scientific interactions with Dr. Jain, even before he joined UC Davis. He also showed a copy of the book “Fundamentals of Digital Image Processing” authored by Anil Jain. Mohini Jain was very pleased to visit Anil Jain’s home department. She congratulated the awardees and thanked the ECE department for inviting her to be a part of the ECE family. Professor Anil Jain was born in India and educated at the University of Rochester. Following a stay at the University of Southern California, he was an associate professor of electrical engineering at the State University of New York at Buffalo. From 1978 until his death in 1988, he was a professor of electrical engineering and computer science at the University of California, Davis, where he founded the Computer Vision Research Laboratory in 1984. 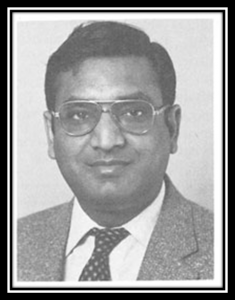 Anil Jain’s research contributions are numerous and widely recognized. A major contribution to both scholarship and research is his book, Fundamentals of Digital Image Processing, published by Prentice-Hall. He received numerous awards for his work, notably the Donald G. Fink award of the Institute of Electrical and Electronics Engineers (IEEE) in 1983 and an award from NASA for his contribution to the reconstruction of the image of Halley’s Comet in 1986. He was elected a Fellow of the IEEE in 1988. Dr. Jain is survived by his wife, Mohini, two sons, Mukul and Ankit, and a daughter, Malini.